(L-R) Chelsea Vincent (FA STEM Teacher/Coach), Harry Ma, Arnold Shorey (FA Head of School), and Jinlin "Wayne" Chen. DOVER-FOXCROFT — There is a first time for everything. The first time you tie your shoes. The first time you ride a bike, or maybe even a first date. For the most part, first times are rough, but they get smoother and easier with time. 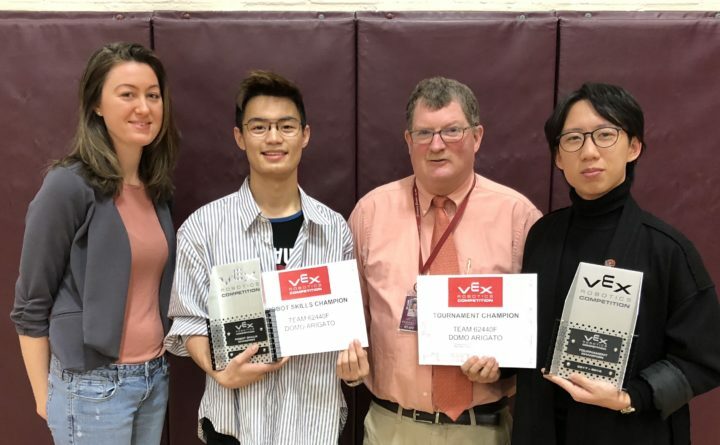 The Foxcroft Academy Robotics team threw that notion aside because in their first year of existence, in their first state championship meet, they won the 2018 VEX Robotics Competition state championship. On Saturday, March 3, the Ponies outlasted 48 other Maine schools to win the Robotics State Championship at Biddeford High School. They partnered with MDI High School and Hampden Academy to win this years’ competition. The all-day event saw middle and high schools from all over the state converge on Southern Maine. The world awaits the Ponies at the 2018 VEX Robotics World Championships, being held April 25-28, in Louisville. Close to 600 other schools from around the globe will be there, and the FA team, “Domo Arigato,” will be one of the entries, as Foxcroft Academy is sending the nine-member team to compete. For the next six weeks, the FA Robotics team will fine tune their work on “Achilles the Robot”, making it the best robot it can be. The team knows that winning a state championship was tough, and winning a world championship will be even tougher, but they don’t fear competition. The Foxcroft Robotics team includes: President Jinlin “Wayne” Chen, Vice President Kaiyuan “Harry” Ma, Treasurer Botai “Jerry” Zhou, Secretary Jordan Thomas, Nhat Huynh, Duong Lu, Natali Barseghyan, Kiet “Vincent” Vo, and Shiyang “Michael” Wang. For information on the VEX Robotics World Championships, visit www.vexrobotics.com.